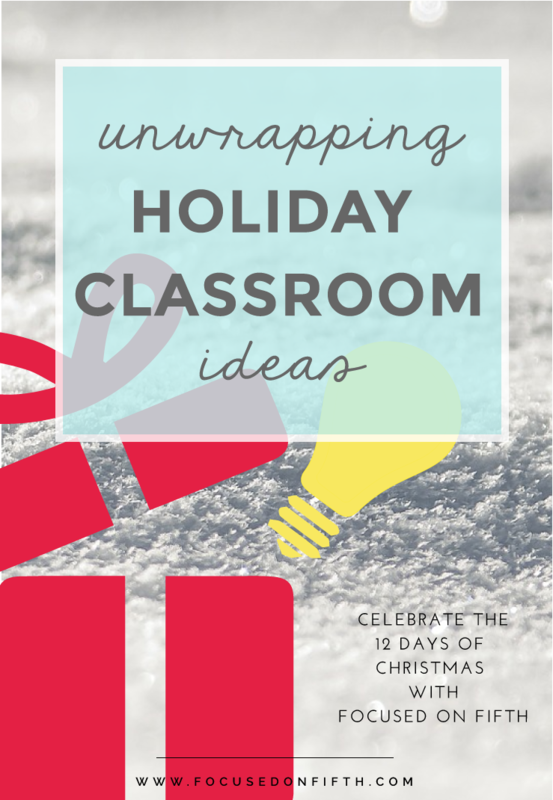 I am happy today to be linked up with some great bloggers for Focused On Fifth’s “Unwrapping Holiday Classroom Ideas”. Every day will be a different topic related to the classroom and the Holiday Season! As a teacher this time of year can be fun, but also a little challenging. I think the main challenge is keeping the students focused on academics when they are so hyped up about the holidays! This is when I think “If you can’t beat them, join them!” … Now I don’t mean throw in the towel and let the little elves party all December long. I mean, use their enthusiasm over the holidays to get them thinking and working in Math! – there are so many things you can do with graphing. You could do a class survey of favorite holiday foods, favorite holiday stories or favorite holiday songs. Display the data on the board and then have students work in groups to create bar graphs, circle graphs or box plots, depending on your grade level. Give students a chance to present their results. To integrate technology you could have your students use Excel or a web based program such as Creative Graph. Ok! I know this is a hard one if you are in a State like mine (Texas) where there are laws about how many days you can have candy on campus, and some districts in other states have different ideas, but if you can bring in candy, please do! Use it for Math! You can bring in a few small bags of candy and split your class into teams. Give each team a bag of candy and let them know they may NOT eat the data until the task is complete and you give them the go! Have them count the total amount of candy and the amount of each. Then they can use the data to find fractions, decimals, percentages for each type of candy. You can take it further by having the groups compare data to see who as more or less of certain types. This could also be done with one type of candy in different colors. Oh man! Here is my holiday nostalgia kicking in! I remember decorating the classroom with green and red paper chains as a child! How do we make that into a Math activity? A few years ago I cut strips on green and red paper and wrote math problems on them. Students worked together to solve the problems and then show them to me. When I confirmed the problem to be correct, they added the problem to the paper chain! My students were so excited to add the papers to the chain. The drawback was that I had to work the night before at home writing a bunch of problems for the chain! I think a new improved version would be to have the students write the problems and then trade with other students! – Now that may sound more like Language Arts than Math, but hear me out! We can use the students love of stories to build on their Math sense! Bring in stories or have your students bring in stories to share! Have them work with partners or in small groups to write word problems. Then have them trade and solve! Bring in catalogues and circulars from Toys R Us, Target, Walmart, etc … Tell students to think of someone they would love to send “secret” gifts to for 12 days! Tell them they have a pretend budget of $100 for the 12 days. Have them look through the fliers and catalogues and plan what they would send that person if they really had the $100 to send the gifts to them. Tell them they should try to send a different gift each day and get as close to the $100, but they can not go over. This can work so many ways. One idea I have is that the teacher can bring in recipes and have prewritten word problems such as ” If Jenny doubles this recipe, how many cups of sugar will she need?”. Another idea would be to have students bring in their favorite recipes and make their own problems. And another variation … have students find ingredients in store fliers and find cost of making the recipe! Ask students if they know the song “Rudolf” and ask them what they think Reindeer Games are. Have them work in groups to create math related reindeer games and then present to class or switch and play! Thank you to Focused on Fifth for the blog link up! Hop on over and see what other bloggers are sharing! There are so many excellent ideas! « Thankful Linkup with FREEBIES!!! These are all great! I remember making those paper chains! I think you are definitely on to something with having the students write the problems instead. This saves so much prep on your end…and I like that it becomes a student centered activity where they are taking ownership over their work. Mrs. 3rd Grade did a similar activity where the students had a snowball fight in class. You should go check out her post to read more about it! Thanks so much for joining our link up! Thanks Angela! I saw Mrs. 3rd Grades post and I liked her idea with the snowballs! I have seen a lot of great ideas on this link up! Your equivalent fractions snowmen activity is really great! I bet your students had fun!